ST. PETERSBURG, Fla. (January 4, 2018) — The Tampa Bay Rowdies have made their first new addition of the offseason, welcoming forward Jochen Graf to the club ahead of the 2018 United Soccer League season, pending leaguer and federation approval. Per league and club policy, further contract details will not be disclosed. Graf, 28, scored 11 goals for the Rochester Rhinos last season, nearly one third of the Rhinos’ 37 total goals. He led the team to a fourth place finish in the Eastern Conference and scored the opening goal in a first round USL Playoffs victory over the Charlotte Independence. Of his 11 goals last season, six came with his right foot, two with his left and three with his head, showing good versatility in attack. 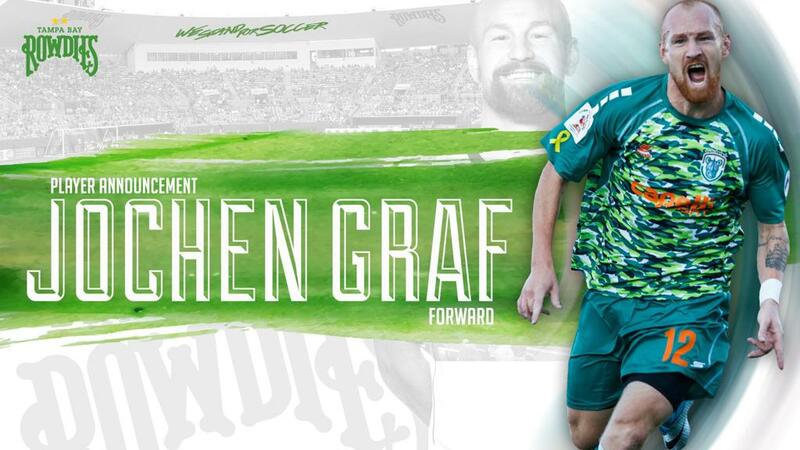 Graf is a Texas native that played college soccer at Bradley University before heading to Europe to play for Germany’s TSV Hertha Walheim and then Sweden’s Lidköpings FK, Carlstad United BK and Oskarshamns AIK. He later returned to the United States in 2016 with Rochester. With Graf’s addition, Tampa Bay’s roster now includes 12 players with more set to be announced in the coming days. COME ON YOU ROWDIES!